This vibrant image from NASA's Spitzer Space Telescope shows the Large Magellanic Cloud, a satellite galaxy to our own Milky Way galaxy. Credit: Credit: NASA/JPL-Caltech/M. Meixner (STScI) & the SAGE Legacy Team. The discovery of young stars in old star clusters could send scientists back to the drawing board for one of the Universe's most common objects. This image from NASA's Spitzer Space Telescope features the Large Magellanic Cloud, a satellite galaxy to our own Milky Way galaxy. Overlaying the image are circles showing the locations of 15 star clusters where multiple generations of stars have been discovered. Credit: Credit: Karl Gordon and Margaret Meixner - Space Telescope Science Institute/AURA/NASA. Compilation by Bi-Qing For and Kenji Bekki (ICRAR/UWA). 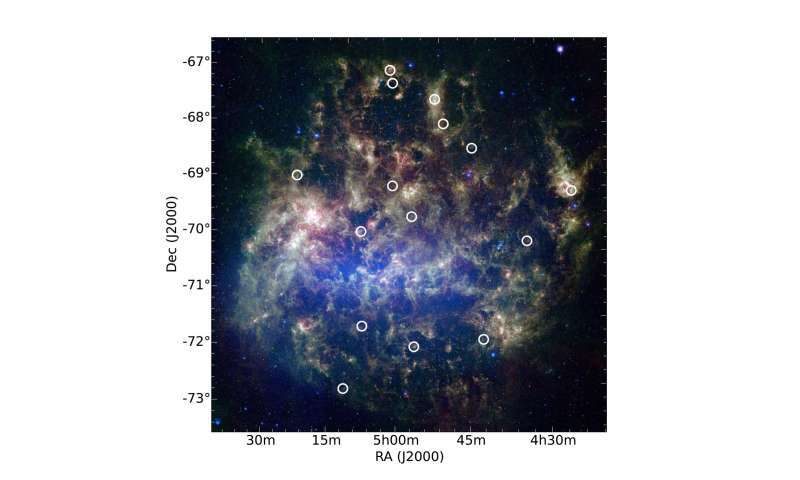 "The formation of these younger stars could have been fuelled by gas entering the clusters from interstellar space," said co-author Dr Kenji Bekki, also from the International Centre for Radio Astronomy Research. Left: This image from NASA's Spitzer Space Telescope shows the Large Magellanic Cloud, a satellite galaxy to our own Milky Way galaxy. Overlaying the image are the locations of 15 star clusters where multiple generations of stars have been discovered. 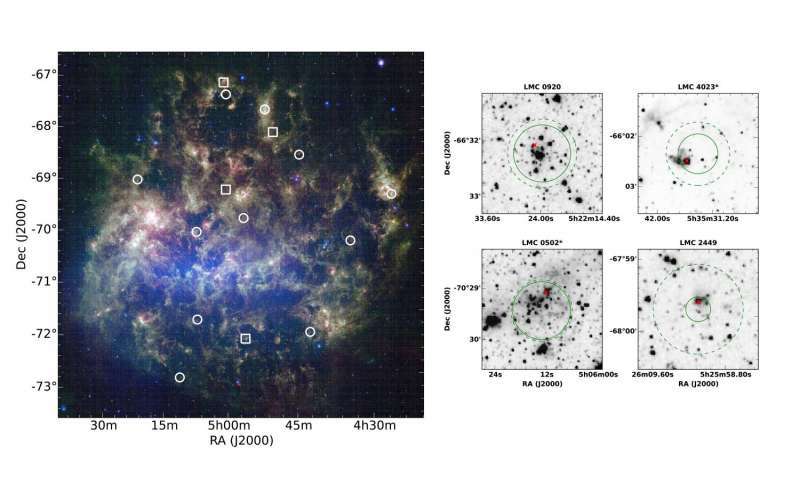 Right: A closer view of four of the star clusters where young stellar objects have been detected. The crosses mark the locations of young stars and the squares in the main image show the locations of these four clusters. Credit: Credit: Karl Gordon and Margaret Meixner - Space Telescope Science Institute/AURA/NASA. Compilation by Bi-Qing For and Kenji Bekki (ICRAR/UWA). "Our models of stellar evolution are based on the assumption that stars within star clusters formed..."
Assumptions gleaned from the Gaslight Era before the Space Age when there was a belief that the space was a vacuum and/or could be modeled as ideal gases. Sadly when in situ measurements of the real plasmas were finally taken and it was proven beyond a shadow of the doubt that these models were completely wrong it changed nothing. Near Earth physics changed dramatically, the same cannot be said for these regions out of reach as they remained the bastion of scientists who had never seen a plasma in a lab let alone understood the physics. "If this assumption turns out to be incorrect, as our findings suggest, then these important models will need to be revisited and revised". He had better be careful, he may just revise himself out of relevance. The edifice of astrophysics is a house of cards built on assumptions developed in the Gaslight Era. ^^^^And what has that pile of irrelevant fail got to do with anything in the article? Gosh. I told you so, long ago. Many times. That the cluster stars actually form from ejections from the core star. The metallicity will vary among the individual stars, largely depending on their size and location within the cluster. That the metallicity is largely dependent on the internal growth rates of the star itself, as new matter generated both therein each star and from the core is largely non-metallic. And now intermediate core black holes found in a cluster, as I had predicted. Gosh. Maniacs, Say it Ain't so! So if my analysis is so lame, what does that make yours?? Lamer?? "These findings support for the multiple-generations scenario as a plausible explanation for the extended main-sequence turn-off." There is therefore no upset applecart, just another revision of the list of possible explanations. Interestingly, the same phenomenon has been observed in globular clusters in the Milky Way. ( see https://arxiv.org...6526.pdf , and references therein). Nope. Just read the paper, and it says nothing about stars being formed from material ejected from other stars in the cluster. Of coarse not, for all you non-thinking obedient followers of the higher science authorities. It was published by merger maniacs. No rational explanations are allowed, unless they conform to the accepted mania. To suggest otherwise is a career killer. Obey the master minds. They are smarter than you. @Tuxford,..paper...says nothing about stars being formed from material ejected from other stars in the cluster. Since accretion of interstellar gas on to clusters does not depend on the ages of clusters, the result strongly suggests that the required fresh gas supply for the second-generation star formation most likely originates from gas ejected by stars inside the clusters. All massive stars (more massive than 8 M�Š�) would have already exploded as supernovae in the SCs with ages greater than 0.1 Gyr. The gas ejected from supernovae is highly unlikely to still remain within the clusters. Some intermediate-mass stars in the clusters are currently dying and ejecting gas through their stellar winds. If the ejected gas can be trapped by the gravitational potential of the cluster, star formation from that gas may be possible. Err, no. read LaViolette's model, as outlined by Tuxford's comments in the articles he highlighted in his OP. It bears no resemblance to what is being discussed in this article. 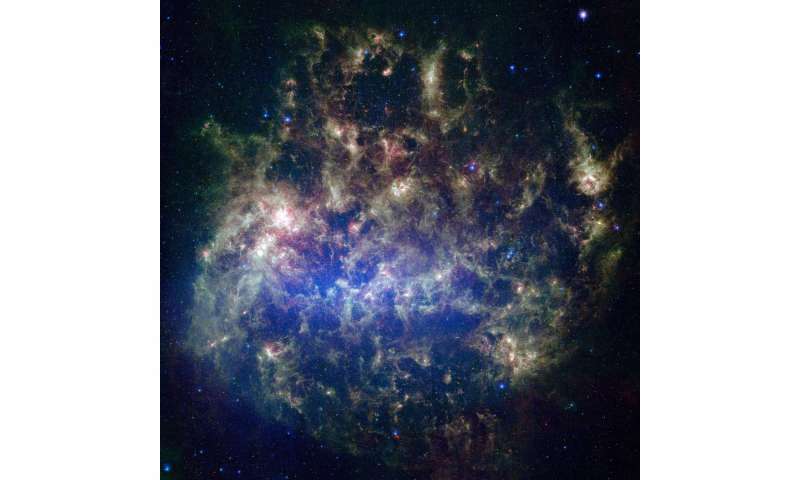 This is just regular star formation from gas clouds expelled in supernovae a long time ago. "Our finding also suggests that the gas supply for second-generation star formation cannot originate from young massive stars but must be from old AGB stars." To paraphrase a poster elsewhere, "LaViolette started off quite promisingly, but then became insane." I would define this as fusion. Older stars within a vast amount of material, not quite an elliptical galaxy, where there exist multiple pockets of charge and charge clusters, i.e. elements, in free frall. Thus the force causing fusion is the "gravitational" force, which can be defined from the charge distribution, an attractive force since charge will always comply, like charge more distant and unlike charges move closer together, So one can see the rotations and revolving elements that will create matter, or be consumed by a star. Not the other scenario. Ejections are varied. Like the current politicians in charge, you think you are so smart, that you completely miss just how lost in the mania that you actually are. It is hilarious. Science is too limited for solving this puzzle, being locked inside a hall of intellectual mirrors, when the solution actually lies outside the hall. Dumb and dumber congratulating each other inside the hall. Lost. Not even blatant contrary observations can shake them from their mania. They must defend their world-view. Their sense of sanity is challenged. And so they lash out, like davy here. "Heliocentric system" has long since collapsed, adding another circle is not a sciencenor the way to the truth. Number of rapidly rotating star (shining star) in the Milky Way has ~ 0.00003% (https://en.wikipe...ication) and it has visible and in a cluster of stars. "The temperature of stars is directly related to the speed of its rotation. Those with slower rotation are red, while with the increase of the rotation speed, also increases the glow and the temperature of a star. As a consequence, it turns white and blue . If we consult the Hertzsprung-Russell diagram, it is obvious that both very small and super giant stars can have the same glow; they can be white, red or blue. " The rotation speed is proportional to age, since speed increase is due to system collapse. However, for objects at very large distances we do not look for a backward pointing Poynting Vector. How do you do that? Oh, excuse me, the speed of light or any object may be from -infinity to + infinity. So do there exist galaxies relative to us; which, we are moving from inside the sphere about this object to the outside. I also must add objects made backwards, + is - and - is plus, relative to us, we correctly call it anti-matter. So what happens long after a collision, or collision to portions of the galaxy. So we are looking at it correctly? Lambda Emitted over Period Measured. We can only see updates, but in what direction in time? If diametrical spherical fields are all that exist, charge is the field and it's updated at the speed of light. So lets start over and redefine unit space. Let c = 1; then, the magnitude of a unit in time and space are equal! You don't really need units, each point has a set of attributes.